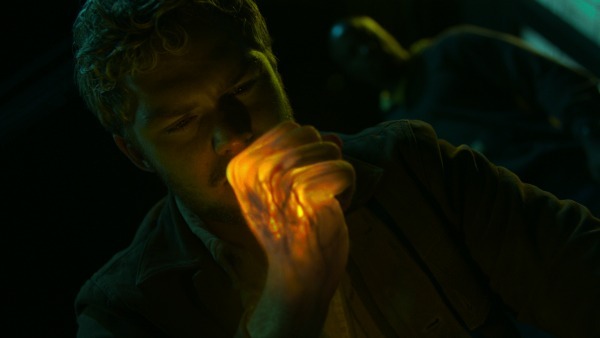 The Defenders unites Matt Murdock/Daredevil (Charlie Cox), Jessica Jones (Krysten Ritter), Luke Cage (Mike Colter), and Danny Rand/Iron Fist (Finn Jones) against the Hand, an “ancient” and “mystical” organization that’s obsessed with immortality. With a cast of heroes that includes a woman and a Black man, diversity should be The Defenders’s strong suit, but the show positions a nebulous Asian organization as the villain; considers white saviors, including Iron Fist and Daredevil, as the only people capable of keeping New York City from crumbling; and relies on Orientalism as a plot device. Yellow peril—the idea that East Asians are barbaric, conniving, and pose a threat to Christian civilization—has been reflected in cinematic representations of Asians since The Mask of Fu Manchu premiered in 1932. In shows like The Defenders and Daredevil, Asian bodies are numerous, in the form of cartoonishly villain ninjas, but Asian characters are not. And when Asians are portrayed as positive characters, they tend to be sexually available women like Elektra Natchios (Elodie Yung) and Colleen Wing (Jessica Henwick). The idea that the Orient may “take over” economically and sexually strikes fear in the hearts of white men because they’re ancient civilizations with deep knowledge, different ideologies, and big populations. America’s history of immigration law reflects its deep anxiety about the Immigrant Spectre—especially with current, rife anti-immigrant sentiment being normalized in the United States. In depicting immigrants as accented, flat characters, The Defenders promulgates a notion that the Orient is to be feared, and that American values, like those represented by the city of New York, are under attack. The show attempts to obscure its Orientalism by casting Alexandra (Sigourney Weaver), a white woman from New York, to lead the Hand. Bakuto (Ramon Rodriguez), a South American man; Sowande/White Hat (Babs Olusanmokun), an African man; Murakami (Yutaka Takeuchi), a Japanese man; and Madame Gao (Wai Ching Ho), a Chinese woman and walking Dragon Lady trope are the organization’s other four fingers. With references to how “ancient” and “mystical” the Hand is, the organization is obviously a blanket Asian syndicate. The lack of specificity about Bakuto’s and Sowande’s origins further illustrates the fear-induced fog through which Europe and parts of North America see a future where cultural hegemony is upheaved. Madame Gao, a supremely evil character we’ve seen in Daredevil and Iron Fist, barely speaks, while Murakami knows English, but speaks mostly in Japanese. The Chinese restaurant where the Defenders seek refuge is a colonized space; the Chinese owners don’t want them there, but Rand smooth-talks them in Mandarin and uses his Black Card to pay six months of their rent. They then apparently “insist” they serve the Defenders four of everything, operating within the stereotype that Asians are hospitable and subservient. Of course the surety that Iron Fist puts down is another lie in a series of lies (will New York even exist in six months?) that white men tell colonized peoples as they occupy their land. The anxieties about the Hand underpin the Occident’s worst fear—the Orient will overtake it in both power and numbers. By creating villains that lack character development and play into the sinister, mysterious Asian villain trope—what do we know about Murakami except that he guts moon bears he illegally hunts with his bare hands?—The Defenders posits a dangerous notion that Asians are easily interchangeable, serve as instruments for furthering belabored plots, and do not deserve further attention. Jessica Jones, Luke Cage and Daredevil rib Iron Fist multiple times, and White Hat calls him the “dumbest Iron Fist” he’s ever met, but unless he changes, his character will remain inherently unlikable. Of course, Iron Fist is not the only white savior within the Defenders. Daredevil was trained by Stick (Scott Glenn) to join the Chaste, yet another enemy of the Hand. The Hand was the villain in Daredevil’s second season, raising concerns about the racism of the inscrutable Asian villain plot and the racist irony of white men appropriating Asian martial arts without giving Asian characters any depth. There is a grand irony that we continue seeing martial arts through the eyes and fists of white men. Popularized by Black audiences, martial arts films, beginning with 1973’s Five Fingers of Death, benefited from a shift in Black activism—from a U.S.-centric Black Power nationalism to a pan-African and Black Internationalism during a time when America pitted itself against the far East (think: Vietnam War). The popularity of martials arts in cinema is thus a direct result of a global solidarity where the underdog fights colonialism and white supremacy. Yet, neither Jessica Jones nor Luke Cage know martial arts while Daredevil and Iron Fist are experts. When Daredevil and Iron Fist appropriate martial arts to fight off countless, interchangeable evil ninjas, it underscores a crucial point: White men weaponize Asian cultures against Asian bodies—unless, of course, those bodies are desirable to them, in which case they colonize them. The Defenders does have two fully realized Asian characters: Colleen Wing and Elektra Natchios. They are both initially “evil”—Colleen’s mentor is Bakuto, and Elektra is a killing machine and dangerous seductress—but their love for Iron Fist and Daredevil, respectively, redeems them. This is no accident. East Asian women are exceedingly fetishized in Western pop culture through the “Madame Butterfly” effect—Colleen is a caring, coddling partner to a whiny Iron Fist, constantly building him up, mediating arguments, and serving as a sexualized sounding board for him to understand his own power. In their very first scene, Colleen comforts Iron Fist after he wakes up thrashing from a nightmare. When Bakuto calls Colleen “weak,” he makes her question her importance in a plot that could’ve easily given her a more agentic role. Claire Temple (Rosario Dawson) supports Colleen through this dilemma, resulting in a satisfying all-women takedown of Bakuto in the final episode. Yet, Colleen’s meekness is intentional—her character plays into the “Lotus Blossom” variant of the Yellow Peril narrative a la The World of Suzy Wong (1960) and Miss Saigon (1989)—a white savior story with a White Knight and the ultra-feminine Lotus Blossom who reaffirm each other through romantic love. By loving white men and not Asian men, these Asian women characters mitigate the white man’s Immigrant Anxiety by providing a “safe” way to continue colonizing Asian cultures. Similarly, Elektra is intentionally hypersexual, a spandex-clad femme fatale who passionately loves Daredevil. While Colleen completely eschews associations with the Hand for the love of Iron Fist, Elektra’s loyalties are more mercurial. 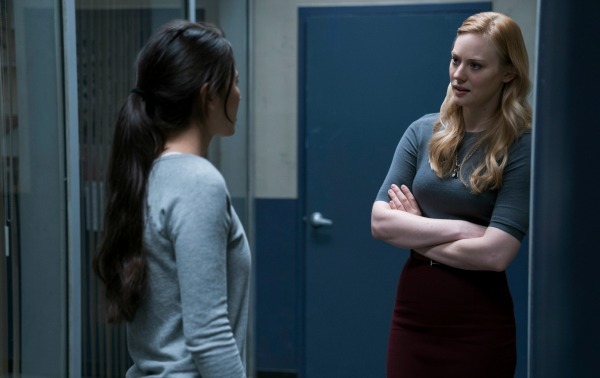 Karen (Deborah Ann Woll), who was once Matt’s secretary and continues to be a secondary love interest, is the polar opposite of Elektra: She’s safe, blonde, and tries to “save” Matt from his “addiction” to being Daredevil. Elektra, on the other hand, is decidedly scary, Asian, and life-threatening. Pop culture is at once taking more risks with progressive characters like Marvel’s Kamala Khan while still falling into whitewashing endeavors like Death Note. Whitewashed narratives, including Ghost in the Shell and Doctor Strange, and white savior narratives are products of the same colonial framework that marries spectacle and narrative. It’s okay to deviate from canon and rewrite fictional characters. We didn’t need a white Iron Fist or the Hand. We do, however, need dynamic Asian characters who exist outside easy Western/Other binaries. As Jessica Jones bemoans in a fight sequence with some operative of the Hand, “Am I the only one left who doesn’t know karate?” If she were a man, she would already have been on her way to enroll at the local dojo.